Born in Milan, Italy, Chef Susy learnt the ropes in her family restaurant under the watchful eyes of her grandmother and mother, her most influential mentors. Their influence is reflected in Chef Susy’s refined, yet rustic and familiar cuisine, where the excellent ingredients are left to speak for themselves. Her work experience has taken her around Europe, the United States and lately in the Middle East, where she finally realized her dream of an organic and sustainable kitchen. 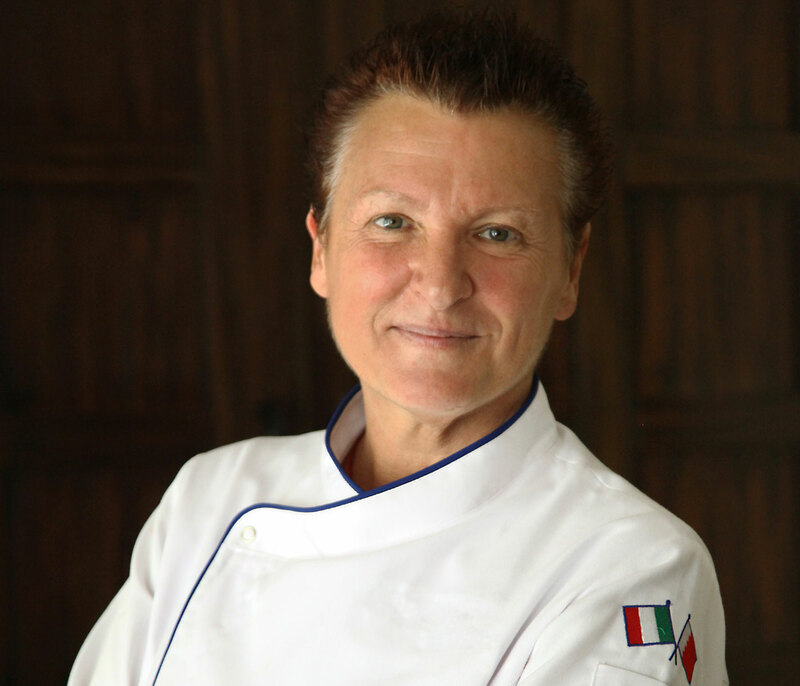 Chef Susy Massetti, started her career in Milan (Italy) in 1973 were she met, married and worked with her former husband, a well-known restaurateur. Later (1985) moved to a seaside port city of Viareggio (Tuscany) where she opened and ran Il Buonamico”” a lively seafood Trattoria with her brother Pietro. Susy lived and worked in the USA from 1995 till 2005 opening and managing stand-alone restaurants in GA (USA). With her Signature Flight Catering Co. as well as in her restaurants she has served USA politicians, film stars and directors as well as international heads of states. In the book, Susy took the opportunity to tell a bit about her upbringing in her family restaurant with wonderful and intimate stories behind each recipe. Chef Susy Massetti is a unique case as one of the rare women at the helm of a professional kitchen in this region that has won many awards and accolades. However, that is merely a statistic, in fact her uniqueness stems from her boundless passion, creativity, dedication and energy coupled with innate humility and an honest approach to food. Truly in love with her new-found home, Bahrain, she participates in many local charitable or of social interest initiatives both with the Ministry of Culture and of Tourism as well as with local suppliers in order to promote “farm2table” and “eat local” food culture. Amongst the many award gained for her restaurants, she was awarded in 2015 with the very first “Outstanding Contribution” award by Time Out Bahrain for her accomplishments in the island and abroad. In the Middle East her 5-star work repertoire includes Sheraton & Radisson both in the UAE and in Bahrain. She was the personal chef of the former Prime Minister of Qatar when she was asked to return to Bahrain to create Masso (2011) a fine dining contemporary Italian cuisine restaurant and lately The Orangery (2014), a Middle Eastern inspired Café’ & Patisserie and more recently (2018) Fishbone. She dedicated eight years to the planning and selection of crops of her organic garden, as well as the selection of the food providers, both locally and abroad. Chef Susy cuisine, very much like her personality, is happy, solar, passionate and honest. The love and respect of the ingredients can be felt in every morsel and she has created dishes that have become staples for her guests. When asked how she defines her cuisine she doesn’t use big words but she points out that she wants it to be “relevant”. Relevant to her guests, relevant to her suppliers down to the small fisherman she buys her fish daily and moreover, relevant to her team. Since June 2018 Her F&B Consultancy is spacing all across the Gulf region with 3 more projects between KSA and Bahrain due to open 2nd and 3rd quarter of 2019. Chef Susy Massetti aims to echo chefs who have created culinary empires, utilizing her culinary abilities and the diversity of her skills and cuisine styles acquired throughout her extensive experience around the world. Chef Susy has effectively gathered an expert Team that shares her philosophy and vision, allowing her to to concentrate on creating new concepts and travelling at the discovery of new ingredients, cuisines and artisans.